Installation view of Roman Ondáks Measuring the Universe at DAAD Gallery, Berlin, 2008. Roman Ondák (Slovakian, b. 1966) Measuring the Universe, 2007. Performance and installation. Collections MoMA, New York, and Pinakothek der Moderne, Munich. Photo: Nadine Dinter. Courtesy of the artist. NEW YORK, NY.- The Museum of Modern Art presents the fourth installment of its Performance Exhibition Series with Roman Ondáks (Slovakian, b. 1966) Measuring the Universe (2007). The work, a recent acquisition by MoMA, will have its North American premiere beginning on June 24, 2009. 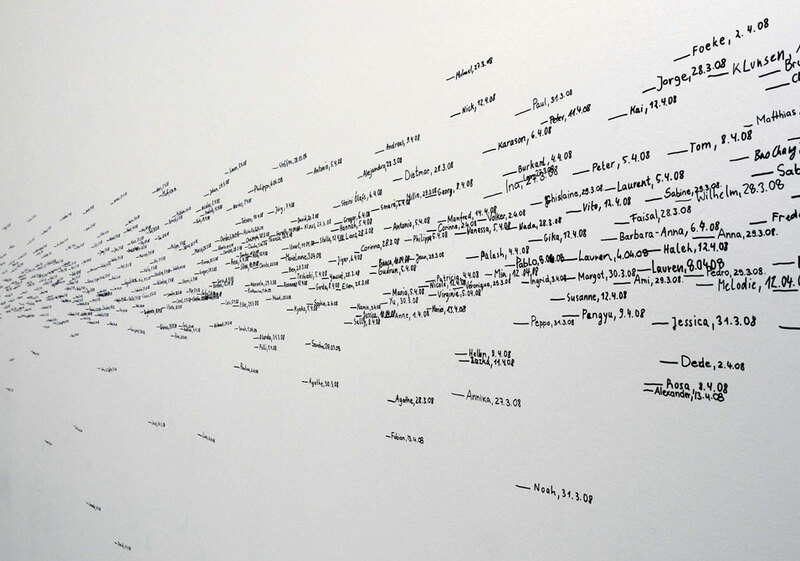 Measuring the Universe, which was first enacted in the Pinakothek der Moderne, Munich, in 2007, is a performance-based work in which the height of each visitor is recorded on the gallerys wall by a Museum attendant, eventually creating a unique wall drawing and a visual record of thousands of museum visitors. Measuring the Universe is the second work solely based on performance to enter MoMAs collection, following the 2008 acquisition of Tino Sehgals The Kiss (2003). The exhibition is organized by Klaus Biesenbach, Chief Curator, with Jenny Schlenzka, Assistant Curator for Performance, Department of Media and Performance Art, The Museum of Modern Art, and on view in the Contemporary Galleries on the second floor through August 24, 2009. The work is brought into existence by simple and minimal means: an empty white cube gallery, museum attendants who are equipped with black felt tip pens, and museum visitors. The interaction among these elements is scripted as follows: once a visitor enters the gallery, he/she is approached by a museum attendant who asks the visitors if he is interested in having his height measured. If the visitor agrees to participate, the attendant then marks the height with a black line onto the wall, and writes the visitors first name and the date the measurement took place. This procedure is repeated continuously with every visitor who enters the gallery for the duration of the exhibition. After a short period of time a distinctive wall drawing appears, consisting of the ghostly traces of thousands of visitors. The three dimensions of the gallery are eventually expanded by a fourth dimension: a recording of time. The result can be understood in reference to others works in MoMAs collection, including Sol LeWitts wall drawings, which are similarly based on a set of simple instructions carried out by someone other than the artist, or Felix Gonzalez-Torress Untitled (Placebo) (1991), which also converts the passive onlooker into an active participant by inviting visitors to pick up silver-wrapped candies from the Museum floor. Smart Structures - What Is Intelligent Architecture Like? Renowned Dutch Photographers Observe New York in "Dutch Seen: New York Rediscovered"
Monterey Museum of Art Debuts New Contest Where Oh Where in Monterey? Bonhams to Sell Painting by Artist Described by Hitler As "Degenerate"